Improvement in neurological signs and symptoms of thalamic syndrome (Dejerine-Roussy Syndrome) due to a stroke 20 years previously (in 1998) after treatment at the Institute of Neurological Recovery in Boca Raton in September 2018, by Edward Tobinick, M.D. Text, images and video © 2018, INR PLLC, all rights reserved. Improvement in chronic intractable post-stroke sensory dysfunction in a 24 y.o. 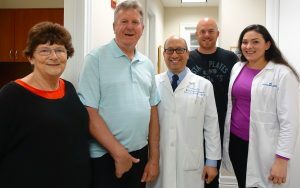 Danish woman, 5 years after stroke, within minutes after treatment at the Institute of Neurological Recovery in Boca Raton on September 21, 2018, by Edward Tobinick, M.D. Text, images and video © 2018, INR PLLC, all rights reserved. Immediate neurological recovery after treatment at the INR Boca Raton, August 13, 2018, two years after a brainstem stroke. Improvements noted in chronic post-stroke pain, visual tracking and gait within minutes after treatment. Family from Melbourne, Australia, celebrates after treatment at the INR in Boca Raton, Florida, on October 30, 2017.